Q: On January 27, a suicide car bomb rocked Afghanistan's capital Kabul, causing major casualties. What is your comment? Are there Chinese institutions or personnel affected by this attack? A: China strongly condemns this attack. We express our deep condolences to the victims and sincere sympathy to the injured and the bereaved families. 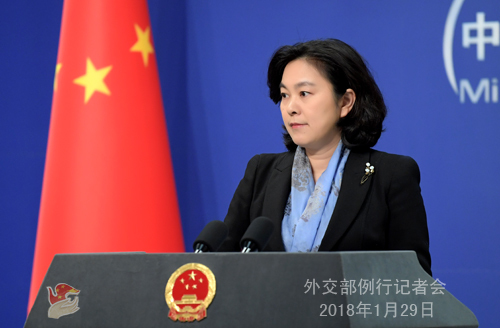 China opposes all forms of terrorism and will firmly support the Afghan government and people in their efforts to combat terrorism, maintain national stability and ensure security. The blast happened only 600 meters away from the Chinese Embassy in Afghanistan. After the attack, we were very concerned about the security of the Chinese Embassy and Chinese citizens in Afghanistan. Fortunately, the diplomatic buildings and personnel were not affected. The Chinese Embassy in Afghanistan immediately activated emergency response mechanism and strengthened security of the Embassy. They also swiftly contacted Chinese nationals as well as enterprises and other institutions in Afghanistan. We have so far received no report of casualty. The Chinese enterprises, institutions and personnel are all safe. The Chinese Foreign Ministry and Embassy in Afghanistan once again warn the Chinese nationals in Afghanistan to step up their security awareness, avoid crowded areas, and call the police or the Embassy in case of emergencies. Q: It is reported that the US national security teams are considering the possibility of building a superfast 5G network by the end of President Donald Trump's term to safeguard US security, in particular guarding against China's cyberattack. What is your comment? A: China's position on cyberattacks is consistent and clear. We firmly oppose and severely crack down on all forms of cyberattacks. The global attack of the WannaCry ransomware not long ago made it clear that the weaponization of cyberspace and its proliferation pose a threat to the global cyberspace security and add to the risk of a cyberspace arms race. The international community, on the basis of mutual respect and trust, shall enhance dialogue and cooperation to jointly address challenges and maintain peace and security of the cyberspace. Q: According to reports, Pakistani Prime Minister Shahid Khaqan Abbasi, when making a speech during panel discussions and giving an interview at the World Economic Forum in Davos, Switzerland, said that the Belt and Road Initiative proposed by President Xi Jinping will contribute to promoting the connectivity around the world and that Pakistan fully supports it. As a major participating country of the Belt and Road Initiative, Pakistan has keenly felt that this initiative has delivered many tangible benefits to its economic development. The infrastructure projects funded by China in Pakistan will benefit not only Pakistan but also its neighboring countries. What is your comment? A: We have taken note of the relevant report. The Belt and Road Initiative proposed by China mainly aims to seek greater synergy between development strategies, draw on each other's comparative advantages and bolster win-win development by stepping up international cooperation and focusing on infrastructure connectivity. During the past nearly five years, the Belt and Road Initiative has progressed smoothly and yielded fruitful outcomes. It has created a large number of new jobs, improved the environment for the development of participating countries and provided larger space and generated greater potential for regional cooperation, thus receiving welcome from relevant countries and peoples. The Belt and Road Initiative originated from China, but it is an idea that will deliver opportunities and benefits to the whole world. Better physical and people-to-people connectivity will generate effective demand worldwide and sustain the momentum of global economic recovery. China stands ready to join hands with all relevant parties to steadily advance the Belt and Road Initiative under the principle of extensive consultation, joint contribution and shared benefits so as to open up broader prospect for promoting common development and prosperity of all countries around the world. Q: In an interview to the Global Times last week, the Indian Ambassador to China said that the CPEC is a major problem for India, and China and India need to be sensitive to each other's concern. How do you think China will address India's concern over the CPEC? Is China willing to talk more about this with India? A: We have seen relevant reports. As regards the CPEC, our position has been made clear many times, and I will not repeat it again. As regards disputes between the two countries, China stands ready to remain in dialogue and communication with India so as to properly manage them and seek a solution acceptable to the two sides. They shall not be allowed to influence the long-term development of bilateral relations. That would be the best way to serve the interests of the two sides. Q: What is your comment on the outcomes of Japanese Foreign Minister Taro Kono's visit to China? The Japanese side has voiced a positive attitude towards its participation in the Belt and Road Initiative. What will be the significance of Japan's participation in this initiative to China? A: There are ample reports on Foreign Minister Taro Kono's visit to China. During this visit, Premier Li Keqiang and State Councilor Yang Jiechi met with him respectively and Foreign Minister Wang Yi held talks with him. The two sides had an in-depth exchange of views on China-Japan relations as well as international and regional issues. They reached consensus on taking the 40th anniversary of the signing of China-Japan Treaty of Peace and Friendship as an opportunity to improve and develop bilateral relations. Now China-Japan relations are at a critical stage where positive progresses have been made and yet many disturbances and hurdles still exist. We hope that the Japanese side can make concerted efforts with China and move in the same direction to bring bilateral relations back to the track of normal and sound development at an early date. Recently, the Japanese side, including Prime Minister Shinzo Abe, has made some positive remarks on the Belt and Road Initiative. During his visit this time, Foreign Minister Taro Kono also voiced a positive attitude towards Japan's participation in the initiative and potential trilateral cooperation. We have said many times that the Belt and Road Initiative put forward by China aims to pool the efforts of all relevant countries to enhance infrastructure connectivity and seek greater synergy between their development strategies under the principle of extensive consultation, joint contribution and shared benefits, with a view to achieving common development and prosperity. Just as we have seen, it has opened up even broader prospects for the development of relevant countries. If the Japanese side adopts a more open and positive attitude towards advancing the Belt and Road Initiative, this will definitely be of positive significance to the respective development of Japan and China and China-Japan relations. Q: India has also said that the CPEC is a question of their territorial integrity and sovereignty. Pakistan previously refused to talk about it. Do you think you are going to bring India and Pakistan to the negotiating table? How do you see this issue? A: Whether it is a dispute between two persons or between two states, what is important is for the two sides to demonstrate sincerity, adopt a flexible attitude, uphold the principle of equality and mutual respect, improve mutual understanding and mutual trust through dialogue, and seek ways to properly handle and manage disputes. We've said many times that the CPEC is a project for economic cooperation, pure and simple. It involves no territorial disputes and targets no third parties. We hope that the Indian side could view this issue in an objective manner. Q: The Indian Ambassador also spoke about issues relating to border in the interview. He said that there should not be any change of the status quo at sensitive points. Obviously, he is meaning sensitive points like the Dong Lang area. There are repeated satellite images, one released by the US itself, about huge buildup by both countries at relevant border areas. Considering that the ambassador has said there should not be alteration of the status quo in sensitive border points, how do you see his comment on this? A: We are aware that Ambassador Gautam Bambawale made these remarks while answering a question on the Dong Lang incident. We have said many times that the Sikkim section of the China-India boundary has been defined by the historical convention, and the Dong Lang area belongs to China and has always been under China's effective jurisdiction. 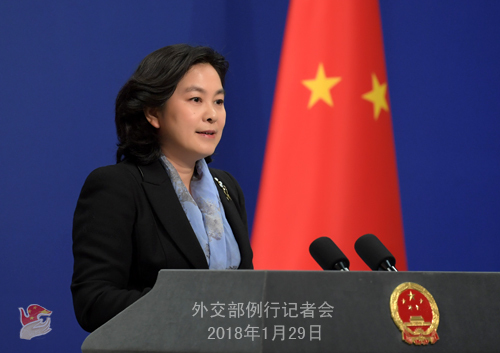 China has made it clear that China will continue to exercise its sovereign rights in the Dong Lang area in accordance with the stipulations of the historical convention and unswervingly safeguard its territorial sovereignty. The Chinese side's infrastructure construction activities in the Dong Lang area are affairs within the sovereignty of China and are completely legal, legitimate and indisputable. In fact, we have repeatedly seen reports from the Indian media, including some sensational ones, about India building more roads and bridges in the border areas or planning to increase military deployment. I would like to emphasize that it is the consensus of both parties to make joint efforts to safeguard the peace and stability in the border areas. We hope that India could take a rational view of the relevant issue and make joint efforts with China to properly handle the relevant border-related issues through the existing mechanisms so as to create a good atmosphere for the healthy and stable development of China-India relations. Q: In his interview, the ambassador mentioned very clearly that India and China are cooperation partners and not rivals. He also said that bilateral relations should not only concern the official side, but also involve civil society groups and people-to-people exchanges. Can you comment on that? A: In our view, as two major neighbors and two developing countries in Asia, China and India should regard each other as opportunities for development rather than as threats to each other. This is an important consensus reached by the leaders of the two countries. We certainly wish to see India as our partner and would like to work with India to strengthen exchanges and cooperation at all levels and in various fields so as to further enhance the friendship and mutual trust between the two peoples, thus winning greater popularity and a more solid foundation for bilateral cooperation in various fields and creating favorable conditions for the two sides to better and more properly handle differences. Q: Indian and Chinese local military commanders met for the first time after the Dong Lang incident on January 26, India's Republic Day, when they talked about local issues. What is the significance of their meeting? A: As far as I know, the Chinese and Indian border troops held a border meeting on January 26. The Chinese side believes that strengthening communication and exchanges between the border troops helps enhance mutual understanding and mutual trust and is conducive to jointly safeguarding peace and tranquility in the border areas. China is willing to join hands with India in further enhancing exchanges and cooperation between border defense units of the two countries so as to jointly maintain peace and stability in the border areas and create a favorable atmosphere for the development of China-India relations. Q: British Prime Minister Theresa May is about to visit China. Can you give us more information regarding her schedule and China's expectation? A: We announced Prime Minister Theresa May's visit last week. The year of 2017 marked the 45th anniversary of the establishment of China-UK ambassadorial diplomatic ties. During their successful meeting at the sidelines of the G20 Hamburg Summit, President Xi Jinping and Prime Minister Theresa May reached important consensus on developing the China-UK relations in the next stage. Premier Li Keqiang and Prime Minister Theresa May also exchanged congratulatory letters with each other on the 45th anniversary of the establishment of diplomatic ties at ambassadorial level, reaffirming their shared aspiration to develop bilateral relations. This visit marks the first annual China-UK Prime Ministers' meeting following President Xi Jinping's historic state visit to the UK in 2015. It is also Prime Minister May's first official visit to China after she took office. China attaches great importance to it. During the visit, Chinese leaders will meet and hold talks with Prime Minister May on separate occasions and exchange in-depth views on bilateral relations and regional and international issues of mutual concern. Prime Minister May will also visit Shanghai and Wuhan, Hubei Province. As the visit draws near, the two sides are in close communication on its schedule and outcomes. We look forward to achieving fruitful outcomes, including stepping up political mutual trust, expanding practical cooperation in trade and all other fields, and enhancing communication and coordination on major international and regional issues. We stand ready to work with the British side to take this visit as an opportunity to achieve new development of the China-UK global comprehensive strategic partnership for the 21st century. Q: Do you think the UK has achieved its goal of becoming China's closest partner in the West now? Second, does China welcome a dialogue with Prime Minister Theresa May on human rights issues during her visit to China? A: Cooperation can always be bettered. As to whether China and Britain have become the closest partners, we may need to wait and see how Prime Minister May's visit this time plays out. The position of the Chinese side is very clear. We are willing to develop increasingly closer and friendly cooperative relations with all countries in the world, including the United Kingdom. 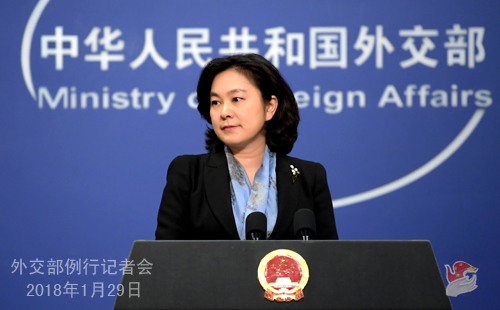 On the human rights issue, China is willing to conduct exchanges and dialogues with other countries around the world. However, such exchanges and dialogues must be based on equality and mutual respect. No country in the world can claim to be perfect on human rights. We hope that countries could learn from each other and make progress together through equal-footed and mutually respectful exchanges, dialogues and cooperation. Q: Last weekend, Japanese Foreign Minister Taro Kono paid a visit to China, during which the two sides agreed to take steps to establish the China-Japan maritime and air liaison mechanism at an early date. What is the specific date for the implementation of this mechanism? Are there any plans for the Chinese leaders to visit Japan? 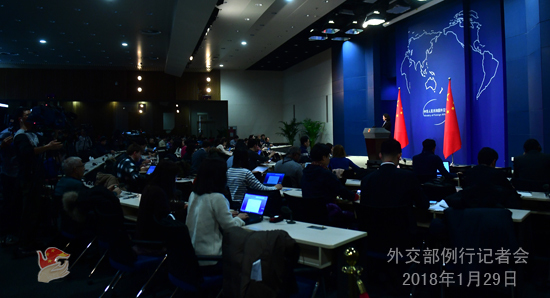 A: Establishing the maritime and air liaison mechanism will help the two sides enhance mutual trust, manage differences and uphold peace and stability of the East China Sea. During Foreign Minister Taro Kono's visit to China, the two sides welcomed their principled agreement on establishing the maritime and air liaison mechanism by the two defense departments, saying that they would like to sign and implement it at an early date. Regarding whether the Chinese leaders will visit Japan and the China-Japan-ROK leaders' meeting which is of Japan's great interest, we believe that maintaining high-level exchanges will definitely enhance mutual trust and promote cooperation. China remains in close communication with Japan and the ROK on holding the trilateral leaders' meeting at an appropriate time. We hope that the three sides can make joint efforts to create favorable conditions and good atmosphere for the meeting and ensure that the meeting can achieve positive outcomes. Q: The Chinese government's control on VPNs is disrupting operations of foreign companies, raising their concerns about competitiveness and leakage of company secrets. Can you tell us more about how these controls will be enforced in the future? Can you talk about whether Chinese regulators can comply with WTO regulations and their commitments to allow foreign companies to compete on equal footings with Chinese companies? A: The question you asked is very specific and is preconditioned on anti-China sentiments. I do not want to respond specifically. However, I would like to advise you to have a recap of the speech made by Director Liu He a few days ago in Davos and the important speech made by President Xi Jinping at Davos a year earlier. You should realize that China opposes all kinds of protectionism, strengthens the protection of intellectual property rights, promotes fair competition, relaxes market access in the financial industry, proactively expands imports and actively promotes the Belt and Road Initiative. China is taking concrete actions to build an open economy along with other countries, carrying out fair and equitable trade, and promoting economic globalization. This year marks the 40th anniversary of China's reform and opening up. We will continue to improve the socialist market economic system, promote an all-around opening up to establish a new landscape of opening up to the outside world, implement a high-level trade and investment liberalization and facilitation policies, and substantially relax market access. We believe this will provide vast space for all countries in the world to further conduct and deepen cooperation with China. It will also provide new opportunities for their national development. We hope that all parties could view China's efforts and progress in this regard in an objective and unbiased way.